Houston is Poetry Town. Every weekend there are events featuring poets young and old. Don’t miss the fun! Public Poetry, the award-winning monthly reading series, will be at Oak Forest Neighborhood Library at 1349 West 43rd Street, Houston, TX, 77018, at 2 PM. 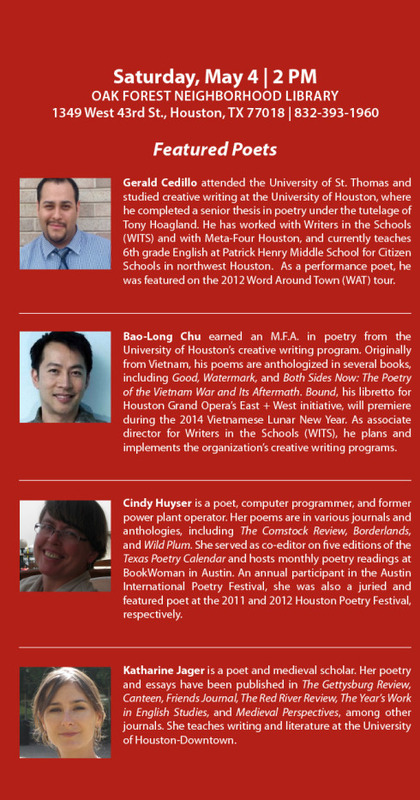 Featured poets include WITS Associate Director Bao-Long Chu. Pluto Wild-Card Slam will be at Heights Neighborhood Library, 1302 Heights Blvd., Houston, TX 77008, from 10 AM-12 PM. Youth ages 13-19 are encouraged to participate. A poetry workshop will kick off the morning, followed by a slam competition.